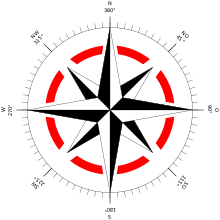 A common compass rose as found on a nautical chart showing both true north and magnetic north with magnetic variation. Also notice the correspondence between the 32-point rose (inner circle) and the modern 0–360° graduations. 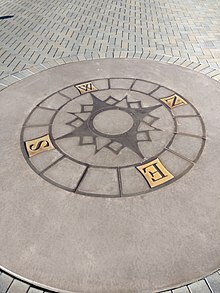 A compass rose, sometimes called a windrose or Rose of the Winds, is a figure on a compass, map, nautical chart, or monument used to display the orientation of the cardinal directions (north, east, south, and west) and their intermediate points. It is also the term for the graduated markings found on the traditional magnetic compass. Today, the idea of a compass rose is found on, or featured in, almost all navigation systems, including nautical charts, non-directional beacons (NDB), VHF omnidirectional range (VOR) systems, global-positioning systems (GPS), and similar equipment. 4-point compass roses use only the four "basic winds" or "cardinal directions" (North, East, South, West), with angles of difference at 90°. 8-point compass roses use the eight principal winds—that is, the four cardinal directions (N, E, S, W) plus the four "intercardinal" or "ordinal directions" (NE, SE, SW, NW), at angles of difference of 45°. 16-point compass roses are constructed by bisecting the angles of the principal winds to come up with intermediate compass points, known as half-winds, at angles of difference of 22​1⁄2°. The names of the half-winds are simply combinations of the principal winds to either side, principal then ordinal. E.g. North-northeast (NNE), East-northeast (ENE), etc. 32-point compass roses are constructed by bisecting these angles, and coming up with quarter-winds at 11​1⁄4° angles of difference. Quarter-wind names are constructed with the names "X by Y", which can be read as "one quarter wind from X toward Y", where X is one of the eight principal winds and Y is one of the two adjacent cardinal directions. For example, North-by-east (NbE) is one quarter wind from North towards East, Northeast-by-north (NEbN) is one quarter wind from Northeast toward North. Naming all 32 points on the rose is called "boxing the compass". The 32-point rose has the uncomfortable number of 11​1⁄4° between points, but is easily found by halving divisions and may have been easier for those not using a 360° circle. Using gradians, of which there are 400 in a circle, the sixteen-point rose will have twenty-five gradians per point. Linguistic anthropological studies have shown that most human communities have four points of cardinal direction. The names given to these directions are usually derived from either locally-specific geographic features (e.g. "towards the hills", "towards the sea") or from celestial bodies (especially the sun) or from atmospheric features (winds, temperature). Most mobile populations tend to adopt sunrise and sunset for East and West and the direction from where different winds blow to denote North and South. The ancient Greeks originally maintained distinct and separate systems of points and winds. The four Greek cardinal points (arctos, anatole, mesembria and dusis) were based on celestial bodies and used for orientation. The four Greek winds (Boreas, Notos, Eurus, Zephyrus) were confined to meteorology. Nonetheless, both systems were gradually conflated, and wind names came to eventually denote cardinal directions as well. In his meteorological studies, Aristotle identified ten distinct winds: two north-south winds (Aparctias, Notos) and four sets of east-west winds blowing from different latitudes—the Arctic circle (Meses, Thrascias), the summer solstice horizon (Caecias, Argestes), the equinox (Apeliotes, Zephyrus) and the winter solstice (Eurus, Lips). However, Aristotle's system was asymmetric. To restore balance, Timosthenes of Rhodes added two more winds to produce the classical 12-wind rose, and began using the winds to denote geographical direction in navigation. 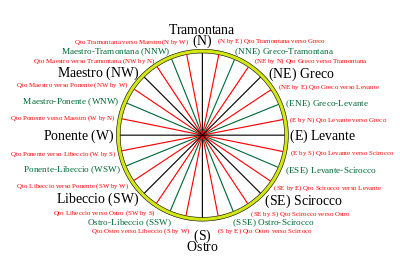 Eratosthenes deducted two winds from Aristotle's system, to produce the classical 8-wind rose. The Romans (e.g. Seneca, Pliny) adopted the Greek 12-wind system, and replaced its names with Latin equivalents, e.g. Septentrio, Subsolanus, Auster, Favonius, etc. 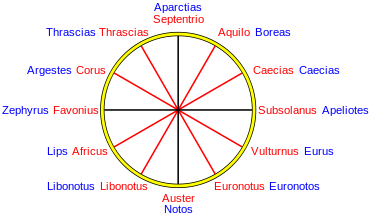 Uniquely, Vitruvius came up with a 24-wind rose. The following table gives a rough equivalence of the classical 12-wind rose with the modern compass directions (Note: the directions are imprecise since it is not clear at what angles the classical winds are supposed to be with each other; some have argued that they should be equally spaced at 30 degrees each; for more details, see the article on Classical compass winds). The western half of the rose would be the same stars in their setting position. The true position of these stars is only approximate to their theoretical equidistant rhumbs on the sidereal compass. Stars with the same declination formed a "linear constellation" or kavenga to provide direction as the night progressed. A similar sidereal compass was used by Polynesian and Micronesian navigators in the Pacific Ocean, although different stars were used in a number of cases, clustering around the East-West axis. In Europe, the Classical 12-wind system continued to be taught in academic settings during the Medieval era, but seafarers in the Mediterranean came up with their own distinct 8-wind system. The mariners used names derived from the Mediterranean lingua franca—the Italian-tinged patois among Medieval sailors, composed principally of Ligurian, mixed with Venetian, Sicilian, Provençal, Catalan, Greek and Arabic terms from around the Mediterranean basin. The exact origin of the mariner's eight-wind rose is obscure. Only two of its point names (Ostro, Libeccio) have Classical etymologies, the rest of the names seem to be autonomously derived. Two Arabic words stand out: Scirocco (SE) from al-Sharq (الشرق – east in Arabic) and the variant Garbino (SW), from al-Gharb (الغرب – west in Arabic). This suggests the mariner's rose was probably acquired by southern Italian seafarers not from their classical Roman ancestors, but rather from Norman Sicily in the 11th to 12th centuries. The coasts of the Maghreb and Mashriq are SW and SE of Sicily respectively; the Greco (a NE wind), reflects the position of Byzantine-held Calabria-Apulia to the northeast of Arab Sicily, while the Maestro (a NW wind) is a reference to the Mistral wind that blows from the southern French coast towards northwest Sicily. The 32-point compass used for navigation in the Mediterranean by the 14th century, had increments of 11​1⁄4° between points. Only the eight principal winds (N, NE, E, SE, S, SW, W, NW) were given special names. The eight half-winds just combined the names of the two principal winds, e.g. Greco-Tramontana for NNE, Greco-Levante for ENE, and so on. Quarter-winds were more cumbersomely phrased, with the closest principal wind named first and the next-closest principal wind second, e.g. "Quarto di Tramontana verso Greco" (literally, "one quarter wind from North towards Northeast", i.e. North by East), and "Quarto di Greco verso Tramontana" ("one quarter wind from NE towards N", i.e. Northeast by North). Boxing the compass (naming all 32 winds) was expected of all Medieval mariners. In the earliest Medieval portolan charts of the 14th century, compass roses were depicted as mere collections of color-coded compass rhumb lines: black for the eight main winds, green for the eight half-winds and red for the sixteen quarter-winds. 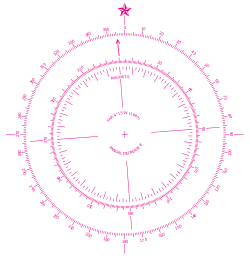 The average portolan chart had sixteen such roses (or confluence of lines), spaced out equally around the circumference of a large implicit circle. The cartographer Cresques Abraham of Majorca, in his Catalan Atlas of 1375, was the first to draw an ornate compass rose on a map. By the end of the 15th century, Portuguese cartographers began drawing multiple ornate compass roses throughout the chart, one upon each of the sixteen circumference roses (unless the illustration conflicted with coastal details). The points on a compass rose were frequently labeled by the initial letters of the mariner's principal winds (T, G, L, S, O, L, P, M). However, from the outset, the custom also began to distinguish the north from the other points by a specific visual marker. Medieval Italian cartographers typically used a simple arrowhead or circumflex-hatted T (an allusion to the compass needle) to designate the north, while the Majorcan cartographic school typically used a stylized Pole Star for its north mark. The use of the fleur-de-lis as north mark was introduced by Pedro Reinel, and quickly became customary in compass roses (and is still often used today). Old compass roses also often used a Christian cross at Levante (E), indicating the direction of Jerusalem from the point of view of the Mediterranean sea. The twelve Classical winds (or a subset of them) were also sometimes depicted on portolan charts, albeit not on a compass rose, but rather separately on small disks or coins on the edges of the map. The compass rose was also depicted on traverse boards used on board ships to record headings sailed at set time intervals. First ornate compass rose depicted on a chart, from the Catalan Atlas (1375), with the Pole Star as north mark. The contemporary compass rose appears as two rings, one smaller and set inside the other. The outside ring denotes true cardinal directions while the smaller inside ring denotes magnetic cardinal directions. True north refers to the geographical location of the north pole while magnetic north refers to the direction towards which the north pole of a magnetic object (as found in a compass) will point. The angular difference between true and magnetic north is called variation, which varies depending on location. The angular difference between magnetic heading and compass heading is called deviation which varies by vessel and its heading. The NATO symbol uses a four pointed rose. Outward Bound uses the compass rose as the logo for various schools around the world. An 8-point compass rose was the logo of Varig, the largest airline in Brazil for many decades until its bankruptcy in 2006. An 8-point compass rose is a prominent feature in the logo of the Seattle Mariners Major League Baseball club. Hong Kong Correctional Services's crest uses four point star. The compass rose is used as the symbol of the worldwide Anglican Communion of churches. A 16-point compass rose was IBM's logo for the System/360 product line. A 16-point compass rose is the official logo of the Spanish National University of Distance Education (Universidad Nacional de Educación a Distancia or UNED). A 16-point compass rose is present on the seal and the flag of the Central Intelligence Agency of the Federal government of the United States (the CIA). HMS Compass Rose is a fictional Royal Navy Flower-class corvette in the novel The Cruel Sea. In the adventure game, Beyond Zork, a compass rose is a flower that can control the direction of the wind. The Compass Rose is the name of a significant tavern in Mercedes Lackey's Valdemar fantasy novels. The Compass Rose is a 1982 collection of short stories by Ursula K. Le Guin. In Diablo III the Compass Rose is a legendary set item. In Marvel Comics, Captain Marvel (Mar-Vell) and his successors, including most recently Carol Danvers, wear the Hala Star emblazoned upon their chests. This star takes the form of an eight pointed compass rose, with four major and four minor points. Edith Pattou's 2003 novel East uses the eight-pointed compass rose (called the wind rose in the novel, due to the sixteenth-century setting) as a recurring motif, both as a metaphor that one's life can go in many different directions and relating to the protagonist's arduous physical journey. The protagonist, Rose, is named for it by her mapmaker father, who creates a new compass rose design for each of his children. Sportswear company —Stone Island implement a compass rose design in their logo bearing similarities to others including NATO's. ^ Patrick Bouron (2005). Cartographie: Lecture de Carte (PDF). Institut Géographique National. p. 12. Archived from the original (PDF) on 2010-04-15. Retrieved 2011-07-07. ^ Brown, C.H. (1983) "Where do Cardinal Direction Terms Come From? ", Anthropological Linguistics, Vol. 25 (2), p. 121-61. ^ Saussure, L. de (1923) "L'origine de la rose des vents et l'invention de la boussole", Archives des sciences physiques et naturelles, vol. 5, no.2 & 3, pp.149-81 and 259-91. ^ Taylor, E.G.R. (1956) The Haven-Finding Art: A history of navigation from Odysseus to Captain Cook, 1971 ed., London: Hollis and Carter., p.128-31. ^ Tolmacheva, M. (1980) "On the Arab System of Nautical Orientation", Arabica, vol. 27 (2), p.180-92. ^ Tibbets, G.R. (1971) Arab Navigation in the Indian Ocean before the coming of the Portuguese, London: Royal Asiatic Society. ^ J. Lagan (2005) The Barefoot Navigator: Navigating with the skills of the ancients. Dobbs Ferry, New York: Sheridan House. ^ List comes from Tolmacheva (1980:p.183), based "with some reservations" on Tibbets (1971: p.296, n.133). The sidereal rose given in Lagan (2005: p.66) has some differences, e.g. placing Orion's belt in East and Altair in EbN. ^ Goodenough, W. H. (1953). Native Astronomy in the Central Carolines. Philadelphia: University Museum, University of Philadelphia. p. 3. ^ Taylor, E.G. R. (1937) "The 'De Ventis' of Matthew Paris", Imago Mundi, vol. 2, p. 25. ^ Wallis, H.M. and J.H. Robinson, editors (1987) Cartographical Innovations: An international handbook of mapping terms to 1900. London: Map Collector Publications. ^ Winter, Heinrich (1947) "On the Real and the Pseudo-Pilestrina Maps and Other Early Portuguese Maps in Munich", Imago Mundi, vol. 4, p. 25-27. ^ Dan Reboussin (2005). Wind Rose. University of Florida. Retrieved on 2009-04-26. ^ John Rousmaniere, Mark Smith (1999). The Annapolis book of seamanship. Simon and Schuster. p. 233. ISBN 978-0-684-85420-5. Retrieved 2011-07-07. ^ "About the Compass Rose Society". Compassrosesociety.org. Archived from the original on 2011-10-07. Retrieved 2011-12-18. ^ "Descripción del Escudo de la UNED (Description of the UNED emblem)". Archived from the original on 2014-01-13. Retrieved 2013-08-08. Wikimedia Commons has media related to Compass roses. The Rose of the Winds, an example of a rose with 26 directions.